In the first quarter of Days of Blood and Starlight, absolutely nothing is all right. Including me. Major spoilers follow for chapters 1-27 (and for Daughter of Smoke and Bone). OK. So. I was not ready for this. Quick recap. 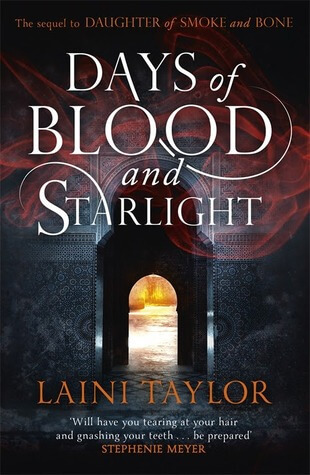 After the events of the first book, in which Karou’s memories of her past life as Madrigal were restored and she was reunited with Akiva … things did not go well. Akiva confessed to having killed Brimstone after the burning of the portals, and the seraphim have taken full advantage, let’s say. Nothing looks good for the chimaera now – but that hasn’t stopped Karou from returning home. Now, though, she’s hell-bent on vengeance while Akiva is left to face whatever music’s playing for him back among the ranks of the Misbegotten. I was warned that this book would be darker than the first, and I thought I was prepared. I should have known. I was not prepared, you guys. I mean, it makes perfect sense that in the aftermath of what Akiva did to help end the war, there would be chaos and darkness and so much death. (Though thankfully the interim between Book One’s finale and this one’s beginning means we don’t have to suffer through the details of that too much; this isn’t Game of Thrones.) What’s hitting me harder than that is the personal aftermath of it all, for both Akiva and Karou. She doesn’t want anything to do with the angel who betrayed all that she believed they both stood for; he’s mired in self-recrimination after learning that the woman he loved isn’t gone after all. All of that is perfectly understandable, and it’s destroying me. Let’s take Karou’s side of things, first. After an ENTIRELY COLD-HEARTED effort by Laini Taylor to have the reader thinking Karou might be dead (as Akiva believes her to be, and we’ll come back to that in a moment), she’s revealed to be holed up with the ragtag remnants of the chimaera army, helping Thiago (still alive, and as creepy as he ever was) to form a resistance movement by taking up the duties of a resurrectionist. Thanks to having her past memories restored, she understands enough of what Brimstone did for the war effort to take his place, and her desire to avenge what was done seems to have entirely clouded Karou’s better judgement. THIS WAS NOT A SMART IDEA KAROU WHAT THE HELL ARE YOU DOING THAT’S THE GUY WHO MURDERED YOU. AUGH. So on one hand, Karou is not thinking at all smart because she’s furious and grieving, and OK, I get that. This is The Scuppy Of Itchiness, cranked up to 100 because even 11 won’t cut it here. On the other hand, though, she’s gone and allied herself with someone who’s so obsessed with “physical purity” (despite the obvious evidence of his own hypocrisy over it) that he’s become obsessed with her. So obsessed that he once executed her for falling in love with someone else (screw his other reasons, he was jealous as hell and this is not how sane people react). Thiago is a perfect example of the scariest monster of them all, because he’s willing to do monstrous things not because it’s for any sort of greater good, but because he enjoys doing it. He’s dressing the chimaera resistance up as righteous vengeance, and his capture of Karou as a necessary part of this effort to fight back, but he’s doing all of this because he enjoys it. He doesn’t just want victory; he wants blood. He wants to cause pain, and I am terrified that he won’t stop at causing Karou pain if he eventually deems it necessary. She’s already doing that to herself, thanks to her efforts to resurrect his people, and he can act like he regrets the necessity but WE ALL KNOW THE TRUTH. I hate everything about this guy. And then, there’s Akiva, who just cannot seem to do anything right. Buckle up, Feelings, it’s going to be a bumpy ride. He’s back among the seraphim, declared a war hero and hating himself for what he did now that he knows his dearest love is back among the living, and that she also hates him for what he did. It’s especially hard reading this book because – and full kudos to Ms Taylor for telling the story this way – it’s possible to see the ways that hope can survive here, if these characters would just make different decisions. Akiva wants his closest friends to understand why he did what he did, and to see that there could be a better way to live if they’d all just fight harder to change things. They aren’t seeing it, but there’s something there that tells me they could if they tried. If Akiva just tries a bit harder to convince them. But it’s hard to give others hope when your own is being crushed with every day that goes by, and let’s not forget that Akiva thinks Karou is dead. Yeah, about that. WHAT THE HELL. What is the deal with that thurible bearing her name? Is it a distraction tactic to throw him off of any effort to find her? Is it a message of a different sort – because let’s not forget Madrigal’s previous plot to thwart her own destruction at Thiago’s bidding? Is this an effort on Karou’s part to make sure the past doesn’t repeat itself more firmly this time? If so, how the hell did she manage to arrange this? And where, if he isn’t still with her, did Razgut go…? So many questions, you guys. It’s all battered emotions and questions right now. I cannot.